Austin Powers was a character seen as a parody of James Bond and being influenced by Harry Palmer and characters played by Peter Sellers. 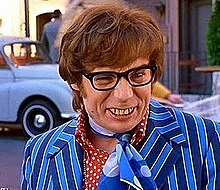 [self-published source] The character of Austin Powers represents an archetype of 1960s Swinging London, with his advocacy for free love, his use of obscure impressions and his clothing style (including crushed velvet suits and Beatle boots). ^ "THE MEDIA BUSINESS: ADVERTISING; Big marketers are betting on 'Austin Powers' to endear them to young people". The New York Times. 1999-06-14. Retrieved 2010-11-05. ^ Montalbano, Dave (December 2010). The Adventures of Cinema Dave in the Florida Motion Picture World. Xlibris Corporation. p. 185. ISBN 978-1-4500-2396-2. Retrieved 5 August 2012. ^ "Myers is funny, but he's no Peter Sellers". Deseret News (Salt Lake City) via HighBeam Research (subscription required). 28 November 2003. Archived from the original on 10 June 2014. Retrieved 5 August 2012. ^ a b Cherie D. Abbey; Omnigraphics; Kevin Hillstrom (2004). Biography Today Performing Artists. Omnigraphics. p. 101. ISBN 078080709X. ^ Evans, Peter (2009-08-31). "The groovy rise and sad fall of Simon Dee, the real Austin Powers". Daily Mail. London. Retrieved 2010-11-05. ^ "TV chat show star Simon Dee dies". BBC. 2009-08-30. Retrieved 2010-11-05. 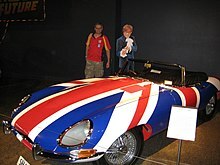 ^ "Dee day for the real Austin Powers". The Age. Melbourne. 2009-08-31. Retrieved 2010-11-05. ^ "Austin Powers has The Force". BBC. 1999-06-14. Retrieved 2010-11-06. ^ "Freebies Power Austin's Promotional Mojo". Orlando Sentinel. Retrieved 2010-11-05. ^ "The 100 Greatest Characters of the Last 20 Years". Entertainment Weekly. Retrieved 2010-11-05. This page was last edited on 21 April 2019, at 10:37 (UTC).